Heavenly Father this is the time of the year to count our blessings. We just enjoyed the spirit of Thanksgiving with friends or family. Which should have reminded us of all the people that are hungry and those who were alone. In our prayers, let us remember how fortunate we are to have a roof over our heads, food on the table, clothes on our back and all our Optimist friends. We are blessed and give thanks to You. Continue to be with us and may we be a blessing to others – especially the youth. Amen! Christy Gariety, chair of Adopt-A-Child, announced that all 36 children have been picked by members and will have a better Christmas. Myron Rheaume, chair of PGI and PDP Development programs, announced he is always happy to explain and help with PDP and PGI. 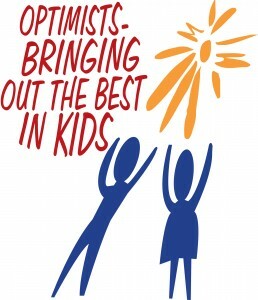 Mike Bevis announced that a new Optimist club is being started at St Leonard’s. Casey Wycoff, chair of Communication Contest for the Deaf & Hard of Hearing, announced that she is looking for participants so please let her know of anyone who is eligible for this opportunity. You can give them her contact information as well. There were only 8 in the state last year but her goal is to have 8 in our region this year. The Optimist Ohio District awards a $3500 scholarship to the winner. Additionally, Casey said she can use more volunteers who can communicate with American Sign Language to judge the contest. Donna Huss announced that Gary Hansen, chair of the Will Cale Scholarship Committee, is still looking for more mentors so that we can help more students. Laurie Poeppelman, chair OptiGear merchandise sales, announced that some OptiGear merchandise is here and the rest will be in next week. Greg Griffin, Christmas tree lot chair, said we have sold 25% of the trees in just 4 days. If you are scheduled for a shift, please show up and if you can’t, try to find a substitute. Beth Duncan reminded everyone about the December 11th Holiday Party at the Presidential Center (Kettering), and the Dinner and a Mystery on Dec 28th @ 7pm @ the Spaghetti Warehouse. She also announced that the entertainment for the Holiday Party will be a local dance company performing excerpts of Nutcracker. 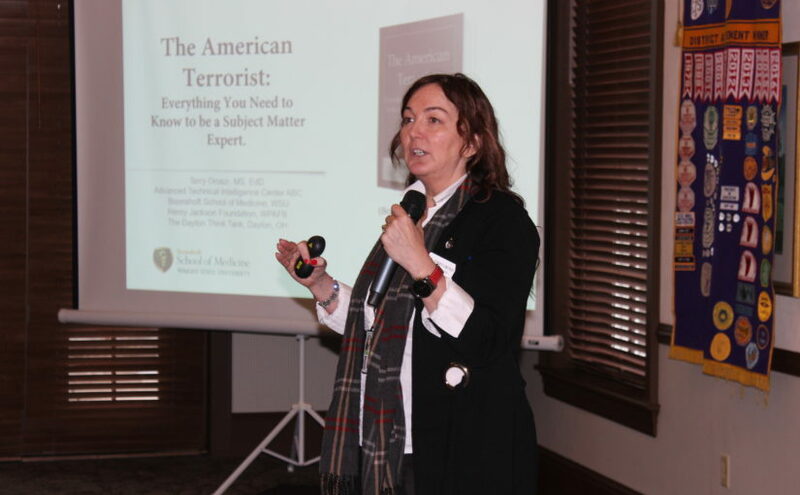 Donna Huss introduced Terry L. Oroszi, M.S., Ed.D., Assistant Professor, Pharmacology & Toxicology; Director, MS Graduate Program, P&T, BSOM; Director, CBRN Defense Certificate Program at Wright State University. She is also a faculty member at the medical center. She has authored two books about terrorism so far with another about to be released. She has also published several articles. Terry spoke at our lunch on July 10, 2018 about worldwide terrorism and terrorists. She was here today to discuss terrorists in and from Ohio. The definition of Terrorism is individuals and groups that want to change the way a group lives. A typical American citizen must commit a crime to be arrested. A terrorist can be arrested for showing intent to commit a crime. Most terrorists are male. Of the few women that are terrorists, their terrorist acts tend to be deadlier. 64% of terrorists have STEM related Educated people with money are more interested in being a terrorist because the poor are too busy trying to earn money for food. A sizable portion of American Terrorists have converted to Islam. She showed and discussed with us several pictures of terrorists from Ohio. She plans to visit prisons and interview convicted terrorists to see if they are still radicalized. So far there, are 29 male and 3 female terrorists from Ohio. Very few people are charged with terrorism. More often they are charged with material support. A person can be arrested for trying to join ISIS. Terrorists often target military installations, public places and bridges. John Speers Showing up for the tree lot at the wrong time – that is OK though, feel free to volunteer for any shift!